It was high time that the prosecutor intervenes in the case of the self-proclaimed “Father Kleomenis”, a racist and social media persona, who claims to be a monk and uploads on youtube full of hate against the Jews. Beginning of the week, the man staged an unprecedented anti-Semitic show. He ‘visited’ the Holocaust Memorial in Larissa, Central Greece. He spit on it, spew out obscene insults, kicked and even threw raw eggs at the Memorial. Kleomenis claims that his actions aim to protect the Greek Orthodox faith. An ‘assistant’ was filming the vulgar show, the video was later uploaded on Youtube. Earlier, Kleomenis and his three ‘assistants’ had attached leaflets with racist content at the entrance of the office of the Israelite Community in Larissa. Kleomenis’ hate videos and especially his latest ‘show’ on Monday, triggered an outrage in the Greek society, with many calling on authorities to persecute him. On Wednesday, the prosecutor in Larissa filed a law suit against Kleomenis and the other three perpetrators for vandalizing the Holocaust Memorial and for violating the law against racism. Authorities had enough material from the video uploaded by the perpetrators themselves. The only information police gave about the lunatic racist is that he is 38 years old. No further information about his and the accomplices; identities were given to the press. The case could not but have also an affect to the Greek Church. 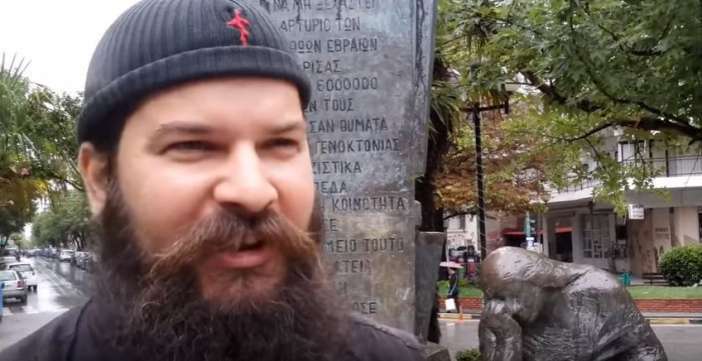 The pathetic self-proclaimed monk, Kleomenis, landed in the Greek internet scene out of the blue and started to upload videos showing him attacking Power Columns, the Rockwave Festival, the Karaiskakis Stadium and a sculpture by Greek artist Tassos Nyfadopoulos. He was claiming his ‘protest actions’ were aiming to bring the sinister Greeks back to the real faith. At the beginning, Kleomenis delirium was apparently fun. His video became viral. But the despicable racist show and the vandalism of the Holocaust Memorial brought an abrupt end to the fun. Sadly enough, there are comments under his antisemitic video, showing support for his actions. I feel the need to stress that for Greek realities, justice authorities and the church showed quick reflexes. PS Last month, another man wearing a monk’s frock was arrested in Thessaloniki after he sexually harassed several young women on public buses. He was a Bulgarian national. One of the women had uploaded pictures on social media.